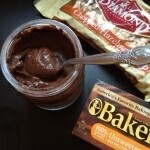 Spoiler Alert: Nutella is never going to be health food. This is not health food. It will always be a treat. I felt like I should lead with that because there are always new folks coming to this blog and I want you to know that we do, in fact, know the difference between a healthy food and indulgences. We talk about that quite a bit. So. Back to the good stuff. Nutella! I had surgery in 2008. This was before Nutella was a common item on US grocery store shelves. It’s been around in Europe, apparently since Europe was invented or something. But here in the US it’s become a popular shelf staple only over the last five years or so. Now I’m all for moderation. And having a little of what you like and a lot of what you need. But Nutella has one big problem I can’t get around. The sugar content. It would kill me. 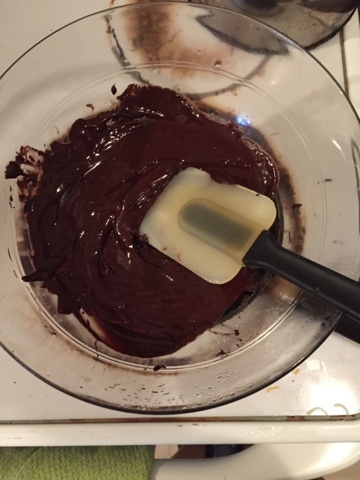 So that’s why I was so happy when Buzzfeed produced a video on how to make your own Nutella at home (btw…the Nutella people are probably preparing a lawsuit against me for the sheer number of times I’ve used the term Nutella in this post! Keeping that in mind…Nutella!). Anyhoo…I basically followed their directions I just modified the recipe a little bit. I like mine a bit nutty still, not completely smooth. The longer you blend, the smoother your final product should get. 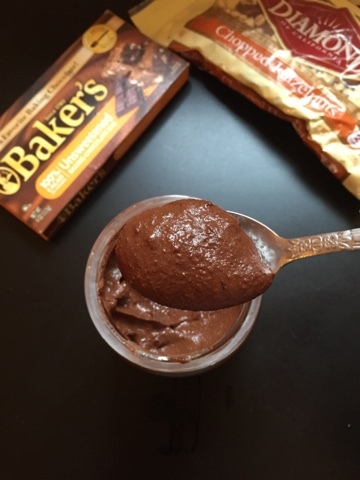 Because…melted chocolate. That is all! Place your chocolate in a microwave-safe bowl and microwave in 10 second increments until it’s all melted. Heat a dry skillet over your stovetop (don’t spray it with nonstick, just leave it dry). Add the hazelnuts and toss them around a minute or two, until you can begin to smell the nuts. Remove from heat immediately. Combine nuts, melted chocolate, oil, milk, vanilla, sweetener and salt in a food processor or blender (I used my Nutri-Ninja) until smooth. If it’s not smoothing out/blending, add milk by the tablespoon until it gets going. Transfer to a clean container (I used a glass jar). This is NOT a recipe developed for canning. Refrigerate and use this within a month. I personally like it right off the spoon (and a spoonful is enough for me). I also tried it on a Pink Lady apple and that was divine as well. To answer your inevitable question, no it doesn’t worry me having this around. Sweet stuff is not my trigger – salty food is! (Which is why you will never see a WLS-friendly Dorito recipe coming from me.) If sweet stuff is your trigger I would not be hurt if you decided to pass on this one. Seriously...it's ok! I love a smidgen of Nutella with two smidgens of peanut butter stirred into an espresso. However I have been missing it because of the sugar content. I will be making and enjoying this weekend though. Thank you for posting the recipe. Mmmmmm yum yum!!! I’ve been thinking about making this for a long time. After a few minor setbacks of burnt hazelnuts, I managed to come out with a pretty good spread. I’m not so good with multitasking and I have limited mobility. Thanks so much Nik ! I read a few helpful hints on toasting the nuts and taking off the skins that I’ll have to try next time. I’ll also make sure that someone is home to assist.